A friend and mentor to many at Winship, Dr. Robert Comis headed up one of the leading clinical trials groups in the world. For nearly two decades, Robert Comis, MD, was the leader of the Eastern Cooperative Oncology Group (ECOG), a federally funded cancer clinical trials group. Five years ago, it merged with the American College of Radiology Imaging Network to become the ECOG-ACRIN Cancer Research Group. ECOG-ACRIN is considered one of the leading cancer clinical trials groups in the world. Comis was not only an excellent scientist, he was considered by many to be a visionary. He passed away on May 10, 2017, of a heart attack. He was 71 years old. 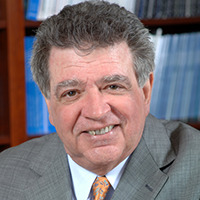 Winship Executive Director Walter J. Curran, Jr., MD, who knew Comis for 30 years and worked with him at both Fox Chase Cancer Center and Thomas Jefferson University says: "His energy, enthusiasm and zest for transformational research was infectious and strongly influenced so many of his colleagues, including me." Curran went on to state: "Bob had an amazing career in oncology, from his early work in developing the concept of multi-agent chemotherapy to later in his leadership in developing new approaches for patients with lung cancer and other malignancies." Comis was a critical leader in the National Cancer Institute-Molecular Analysis for Therapy Choice (NCI-MATCH) trial which is now open at Winship. The study seeks to determine whether treating patients with certain drugs or drug combinations that target changes in the tumor genes will shrink the cancer, regardless of its location in the body. Comis is also remembered as a mentor to many, including Winship's deputy director Suresh Ramalingam, MD. "His leadership allowed for several Winship faculty members to have prominent roles within ECOG-ACRIN and thus make contributions at a national level to advance the field. Dr. Comis inspired people to not lose sight of the big picture. His leadership style was worthy of emulation for many reasons including his way of bringing together the best people and allowing them to lead the path."